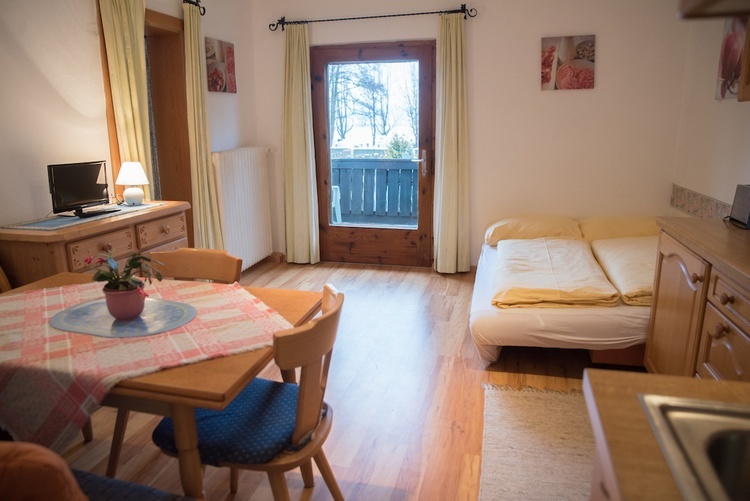 Our cozy house on the lake offers space for up to 46 people and is located just 100 meters from the sunny north shore of Lake Zell. 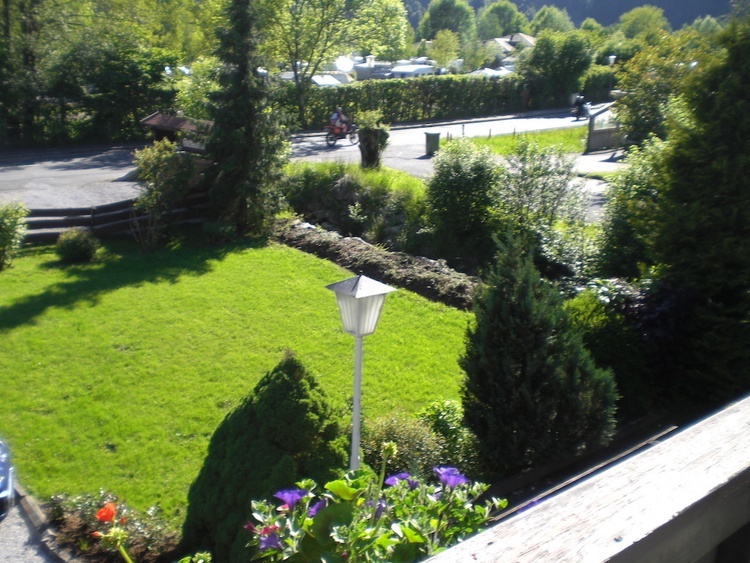 From the house you can enjoy a wonderful view of the impressive lake and mountain landscape. The cozy and traditionally furnished self-catering house is rented as a whole (on request, individual apartments). 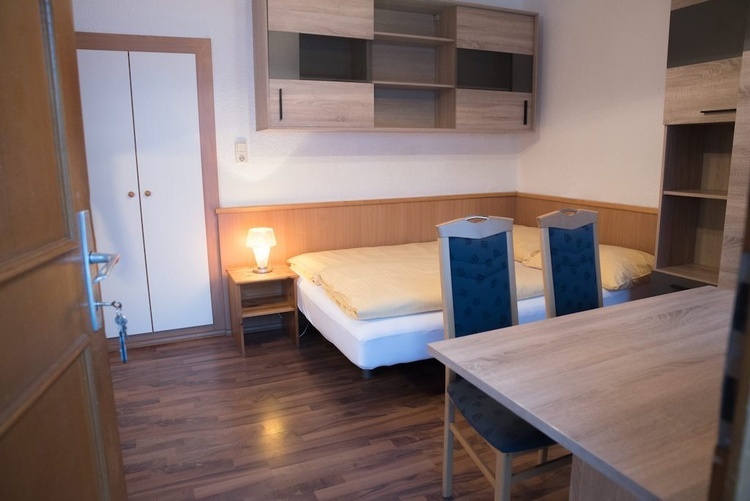 It has a total of ten separate apartments and two attic rooms with dormitory. In each of the apartments there is a bathroom with toilet, a sitting area and a kitchenette with stove, fridge, coffee maker, kettle and crockery. In the hallway there are three more separate WC's. Outside there is a garden with a small stream next to the house and a terrace with garden furniture, parasols and a large barbecue. Furthermore, there is an outdoor sauna which can be used for 150 € / week. Directly at the house there is room for 10 cars. Behind the house there is a ski room and a garage for bicycles. Apartment No.1 is the largest and can accommodate up to 8 people. 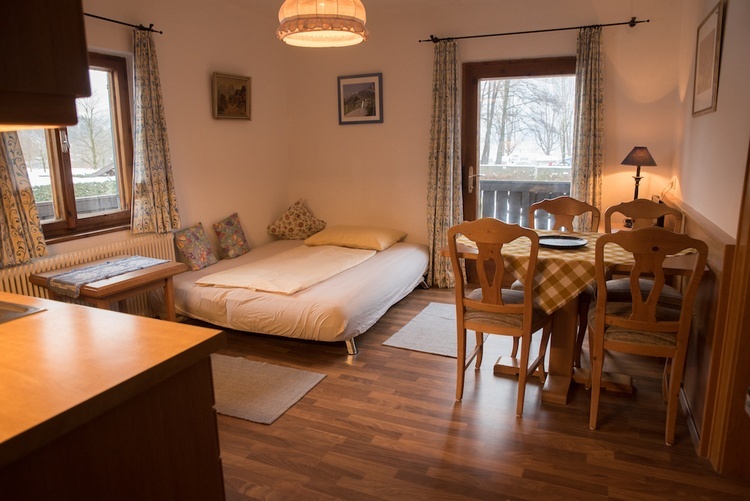 Directly in the entrance there are two separate toilets (one with ski boot) and a double bedroom. At the end of the corridor you reach the back of the ground floor, where the remaining bedrooms are located. There is a walk-through room with a double bed, a sofa bed, a TV and a bathroom with shower and toilet. Through this room leads to another double bedroom. 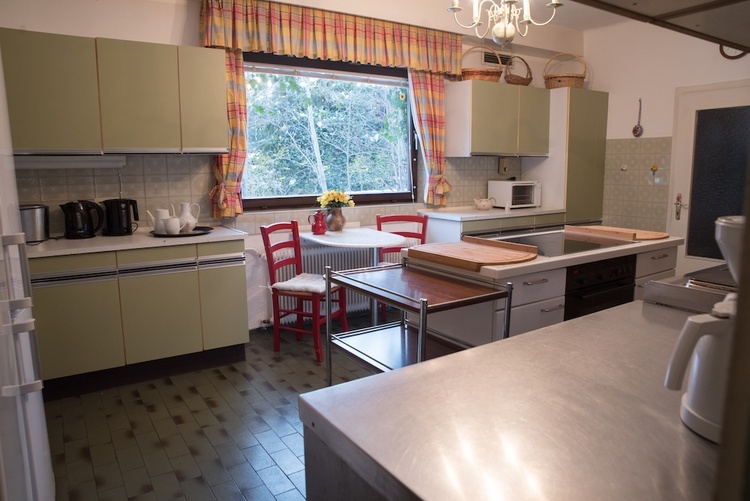 In the apartment there is a large kitchen with free-standing kitchen island with worktop and two electric stoves as well as a large fridge, a freezer, a dishwasher, a microwave, two coffee machines, two kettles, a bread slicer, a toaster, a blender, enough cooking utensils and crockery. A pantry and utility room with washer and dryer are also available and can be used free of charge. 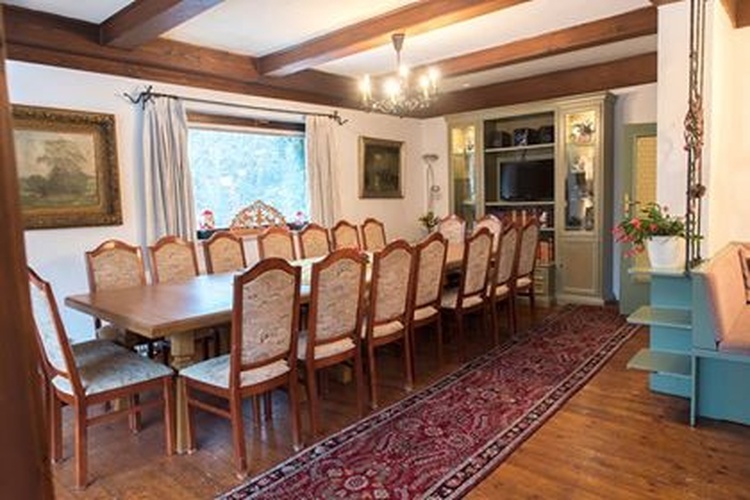 To the front of the terrace and the garden, is the large living and dining room with adjoining bar area and seating (chairs and tables, armchairs, sofa, sitting areas, etc. ), for up to 40 people. 5 € per person once for heating costs: electricity, oil & wood. Calculated from November to April. 500 € deposit once (in cash on the spot or credit card deposit). 13 € per person once for: bed linen, hand and bath towels. If you do not order them from us, you have to bring them yourself. 25 € per night for sauna. WiFi, cot and high chair (please order in advance), washer & dryer. The house on the lake is located a few meters from the lake. Along the lake runs a promenade, so you can walk to Zell am See (about 3 km) or even around the lake (in about 3 hours). A ski bus stop is 100 meters from the house. From here you will be driven to the ski lifts free of charge. Opposite the house is the Seecamp Restaurant, with great local and international cuisine. There you can also order breakfast sandwiches and buy cold cuts or milk. The Zell am See-Kaprun ski area is the most versatile and unique in Austria. This is due to its sparkling lake with drinking water quality, its green mountain meadows in summer and its snow-white glacier all year round. Zell am See-Kaprun is one of the most family-friendly regions in Europe and one of the top addresses of international recreational destinations. 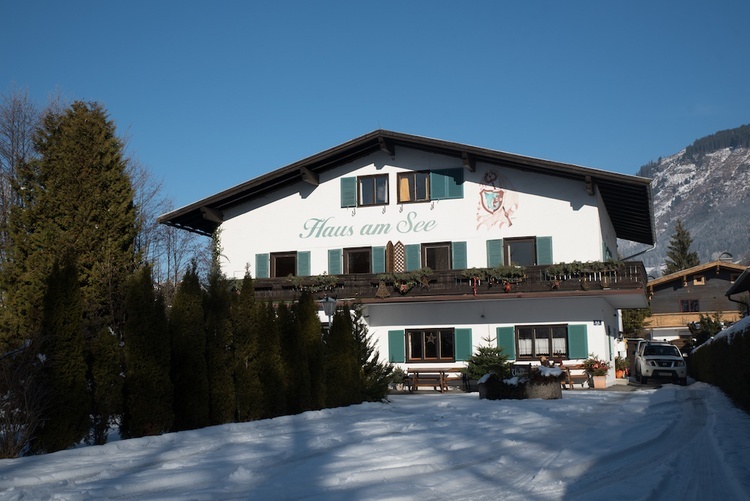 The towns of Zell am See and Kaprun are 8 km apart and give the holiday region its name. 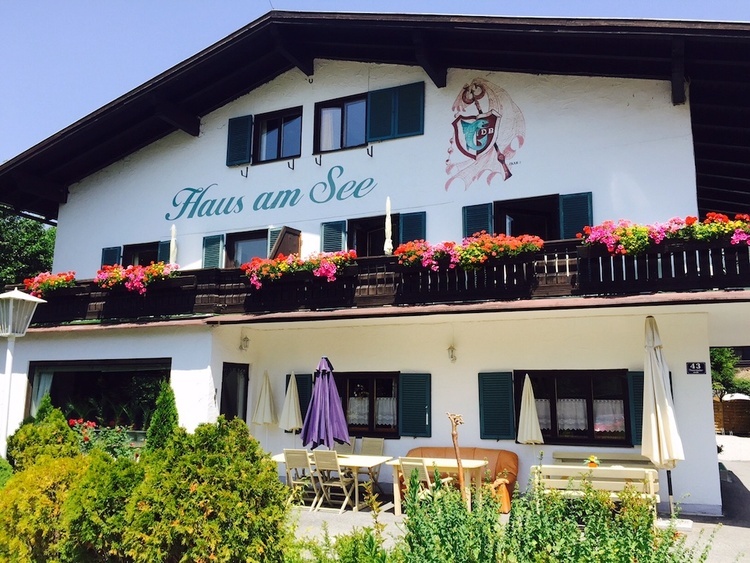 As the name suggests, it lies on the shores of Lake Zell and at the foot of the Schmittenhöhe. Kaprun on the other hand hugs the mountains of the Hohe Tauern and the Kitzsteinhorn glacier. 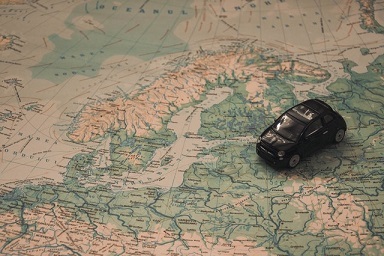 In the summer numerous leisure activities can be practiced in the region. If it gets too hot for you, you can just jump into Lake Zell and go for a swim. Or take a boat trip or bike ride around the lake. There are no limits to the recreational activities, so you can easily choose one of the many trails around the lake and mountains to relax. The Zell am See-Kaprun Golf Club is made up of two equivalent 18-hole courses and can easily be reached on foot or by bike, because it is only 7 km away and directly on the lake. In summer, it is worthwhile to visit the Großglockner, because at 3,798 meters it is the highest mountain in Austria.